Looking forward to checking out the new Repair Cafe, at 10 Hulfish Street in Princeton, next to Jazams. A flyer put out by Sustainable Princeton says it's open "most evenings and weekends through July and August", with a special gathering this Wednesday, July 26, 5:30-7:30, for people to learn about bike and furniture repair. Almost exactly five years ago, I hosted a repair cafe in "Steve's Garage". With the help of all the support videos and chatrooms the internet provides, and a hardware store close at hand, I had had good luck fixing a garage door, my pickup truck, a Bosch washing machine, and many other things. There can be a tendency to leave these unfinished "projects" sitting around for extended periods of time, but it feels good to repair things rather than throw them away, and it's good exercise for the creative, problem solving functions of the brain. As I wrote back then, the repair cafe concept was meant to extend those solo efforts "with the power of collective thinking to solve problems, and the pleasures of good company. I think of us as kindred spirits to WALL-E, fixing stuff with our wits, spare parts and the tools at hand, wishing we could fix the planet, too." So, throw a broken chair over your back, jump on your bike, and head to the Repair Cafe. There's also a website devoted to repair cafes. what are these marks on the new bluestone? Can't have that. Turns out the furniture is supposed to have plastic feet, all of which wore down over time, leaving the rusting steel in direct contact with the patio stone. Fixing up the patio now means fixing up the furniture as well. Fortunately, the local hardware store has replacements that can be hammered lightly into place, like a farrier replacing a horseshoe on a horse. 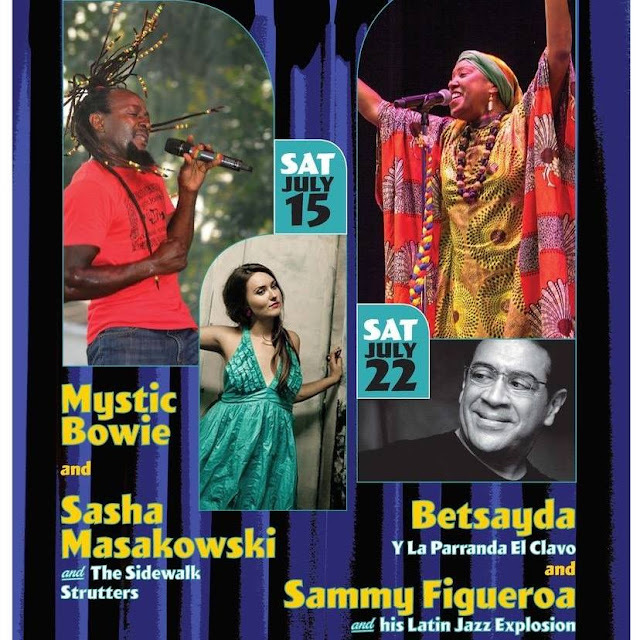 Blue Curtain and the Princeton Rec Department host two concerts this summer in the beautiful setting of Pettoranello Gardens. Park in the Community Park North parking lot off of Mountain Ave and walk down into Pettoranello Gardens. Or ride you bike. This year, Jamaican and latin jazz. Meanwhile, this Thursday, July 13, African banjo player Cheick Hamala Diabate performs, 6-8 at the Princeton Shopping Center, sponsored by the Arts Council of Princeton.